Isotretinoin belongs to the family of medicines called retinoids, which are similar to vitamin A. Isotretinoin, like other retinoids, works by altering DNA transcription. This effect decreases the size and the output of the sebaceous glands. It also makes the cells that are sloughed off into the sebaceous glands less sticky, and therefore less able to form blackheads and whiteheads (comedones). It also reduces the number of bacteria in the sebaceous glands and on the skin surface. One downside to the drug is that it does carry a host of serious side effects (as well as some less serious but still annoying ones), so make sure that you evaluate the pros and cons with your doctor before deciding whether this medication is the right treatment choice for you. Isotretinoin is generally used for nodular, pustular acne that has not responded to full courses of several oral antibiotics. 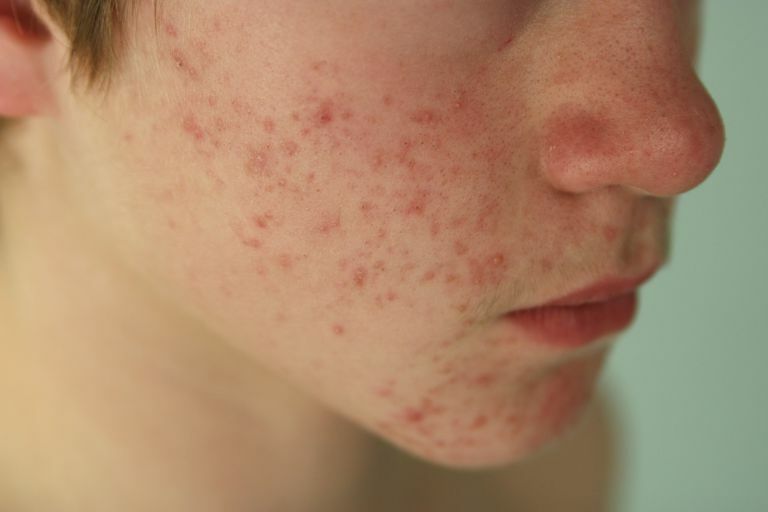 The trend in isotretinoin prescribing for acne has been toward using it earlier in the course of the disease, especially if there is significant scarring. While isotretinoin is used primarily for severe acne, it has also been used for other disorders such as psoriasis, lupus, and lichen planus with varying degrees of success. Several dosing regimens are used, but the most common regimen involves starting with a low dose, then increasing the dose after several weeks. The length of the treatment course varies but generally lasts from 16 to 20 weeks. Some people notice that their acne initially gets worse after starting isotretinoin therapy. The number of acne lesions usually does not increase, but the lesions may become redder or more painful. This is normal, lasts only a short while, and is not a reason to stop using isotretinoin. The side effects of the drug have been a controversial topic. The most noticeable, serious side effect is its teratogenicity. This means that isotretinoin causes birth defects if women take it while they are pregnant. The birth defects that isotretinoin causes include central nervous system, facial, cardiac, and thymus gland abnormalities. After isotretinoin treatment has been completed for one month, a woman can get pregnant without worry about birth defects. Isotretinoin does not affect fertility or make it difficult to get pregnant. Women who are taking isotretinoin should use two forms of birth control during this timeframe: a month before treatment through the end of the first month of treatment. Isotretinoin therapy also has the following serious side effects. Headaches, if persistent and associated with nausea, vomiting, and blurred vision, may be a sign of a condition called pseudotumor cerebri. The risk of depression, psychosis, and suicide attempts increases during treatment and returns to normal after discontinuing the drug. The production of tears in the eyes is decreased, which can cause red, itchy eyes and possibly ulcerations of the cornea, especially with contact lens wearers. The ability to distinguish between shades of black and white can be decreased, causing night blindness. Liver enzymes can become elevated, causing jaundice, hepatitis, and abdominal pain. Isotretinoin therapy can also cause the following less serious, but potentially annoying side effects. Prior to starting isotretinoin therapy, patients should have blood work done to check triglyceride levels, liver function, and a complete blood count. Women should also take a pregnancy test. Periodically, during the course of therapy, but especially one month after starting therapy, these labs are checked again. A standard course of therapy is 16 to 20 weeks. At the end of 16 weeks, about 85% of patients are clear. The beneficial effects of isotretinoin do not stop when the drug is discontinued. A further reduction of acne lesions and scarring is seen for months after treatment has stopped. Another beneficial effect of isotretinoin is that after a course of the drug, the skin usually responds better to conventional acne therapy. The side effects of isotretinoin therapy have prevented some people from considering it as a viable therapy. Despite its side effects, isotretinoin remains the most powerful and promising therapy for moderate to severe acne. Used in a prudent manner, with careful monitoring, it can change the life of an adolescent or young adult. Would You Consider Light Therapy for Your Acne Treatment?